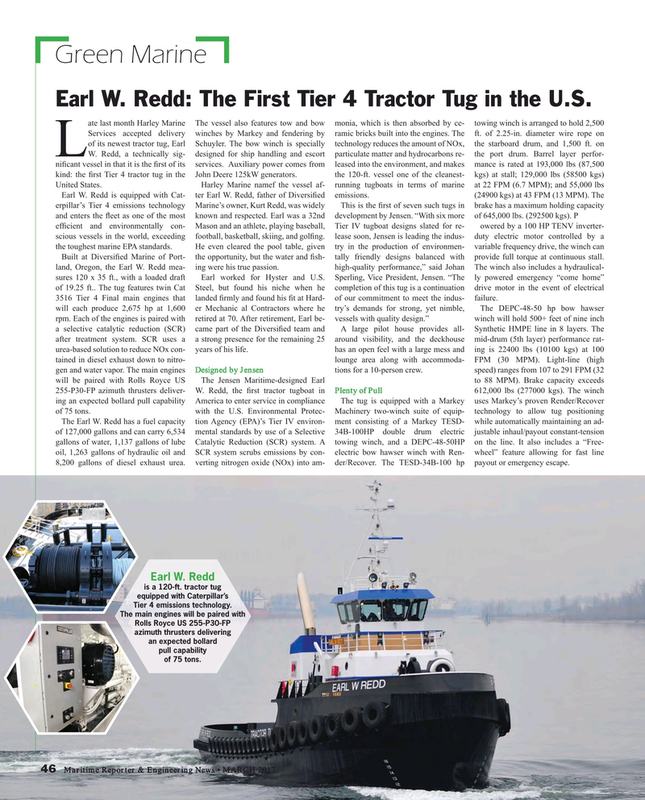 Earl W. Redd: The First Tier 4 Tractor Tug in the U.S. Built at Diversi? ed Marine of Port- the opportunity, but the water and ? sh- tally friendly designs balanced with provide full torque at continuous stall. land, Oregon, the Earl W. Redd mea- ing were his true passion. high-quality performance,” said Johan The winch also includes a hydraulical- sures 120 x 35 ft., with a loaded draft Earl worked for Hyster and U.S. Sperling, Vice President, Jensen. “The ly powered emergency “come home” of 19.25 ft.. The tug features twin Cat Steel, but found his niche when he completion of this tug is a continuation drive motor in the event of electrical 3516 Tier 4 Final main engines that landed ? rmly and found his ? t at Hard- of our commitment to meet the indus- failure. The Earl W. Redd has a fuel capacity tion Agency (EPA)’s Tier IV environ- ment consisting of a Markey TESD- while automatically maintaining an ad- of 127,000 gallons and can carry 6,534 mental standards by use of a Selective 34B-100HP double drum electric justable inhaul/payout constant-tension gallons of water, 1,137 gallons of lube Catalytic Reduction (SCR) system. A towing winch, and a DEPC-48-50HP on the line. It also includes a “Free- oil, 1,263 gallons of hydraulic oil and SCR system scrubs emissions by con- electric bow hawser winch with Ren- wheel” feature allowing for fast line 8,200 gallons of diesel exhaust urea. verting nitrogen oxide (NOx) into am- der/Recover. The TESD-34B-100 hp payout or emergency escape. Rolls Royce US 255-P30-FP azimuth thrusters delivering an expected bollard pull capability of 75 tons.